It's part of human nature that we feel the urge to fill space with objects we don't really need or use. A bit like a third rate website where the designer (usually at the insistence of the website owner) has tried to cram every single piece of information about a product or service onto one page. The page looks busy, cluttered and nothing stands out. As in so many things in life, less is often more! A home office is a kind of small 'version' of your house, so you're idiosyncrasies will probably follow you there, but you really need to ensure that you are maximising the limited space available. This has to be top of the list. If you have loads of files and documents that very rarely see the light of day, you could probably store them somewhere else. If there are other things that hardly ever get used then consider moving them out. Try and make a point of removing anything that hasn't been used in the last couple of months. This could include seasonal items as well – so if it is summer do you still need the portable electric radiator? Make a point of having a regular de-clutter. A room tends to look neater if there are not a large number of objects on show. So a desktop, stationery organiser will make a desk look tidier than if there are lots of things lying around on the desk. Similarly, a filing cabinet with drawers and dividers will tend to look neater (with documents out of sight) than shelves with files and papers on display. Assuming you don't get frequent visitors to you home office, then a folding visitor chair or chairs will take up much less space when not in use. I have quite a large office desk with extendable sides, so when I haven't got paper strewn all over it, the desk can become half the size! Vertical height storage systems and shelves 'over-hanging' your desk are a very effective use of space as this doesn't limit the area in the office where you are likely to stand or walk. Shelves that are positioned high up a wall will tend to be a bit more out of sight and unlikely to restrict movement. 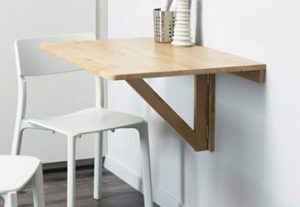 If you don't have an extendable desk then you could make temporary desk space with a wall-mounted, drop leaf table like the one pictured – when not in use, simply fold away. You'll probably want a contemporary style desk and chair if you have a modern-looking home office. The size needs to be very carefully considered – too big and it will take up too much space and too small and it may not be fit for purpose. As mentioned before, an extendable-leaf table is a really good compromise. You might also want a coffee table and, as with the guest chairs, a foldable one will normally do a the job well enough! It is unlikely that anyone is going to position the desk and chair in the middle of the room but you may want to arrange it nearer to a corner and certainly ensure that the work area doesn't block any 'pathway'. If there are a few bits of clutter remaining then if anything it should be in a corner and as far away as possible from the entrance. It is no obscure magic magic trick that a medium to large mirror will bring more natural light to a room as well as making the space seem slightly bigger. No need to go mad and have mirrors on every wall, but one well-positioned mirror will make a positive difference. Probably the best position is directly opposite the main natural light source for the office. Attractive 'living' or dining rooms in a house will have a good focal point like a fireplace or even a big TV screen. This isn't going to be the case in a log cabin home office but you can create a tasteful focal point with a nice, large 'oil on canvas' picture like the kind of work by Magggie Banks as featured on bigart.co.uk. You'll also find that lighter colours will work better in terms of giving the illusion of more space. If you really want to make an impact you could consider commissioning a mural – these can be amazing! Using the technique known as ‘Trompe L’oeil’ you could have one wall painted exactly like you garden so that your office looks like it only has three walls – or you could paint 'fake' doors or windows! An artist who is available for commissions and has done a lot of work like this for businesses is Julian Kirk. A garden office will unlikely have the ceiling height of a room in a house so it is best not to have hanging lights or in fact anything hanging from the ceiling! The ceiling is another possible candidate for some Trompe L’oeil. A nice clear floor space always gives the impression of a bigger room so any unnecessary floor clutter needs to be hidden and removed. A clean, warm wooden floor does not require a rug! Assuming your log cabin office has some form of outdoor space or over-hang, then it is always going to be better to position a door mat outside rather than indoor. Making a point of avoiding wearing shoes indoors will help keep the floor spotless! As you can tell from the ideas above, a very 'minimalist' approach will give your home office the appearance of a bigger space. If you have any other space saving ideas or clever tips to make a room feel bigger, then please share your ideas with us. This entry was posted in Garden Offices on 26th August 2016. It has been estimated that 1 in 6 people in the UK are running some form of online business from home! Many traditionally office-based activities can be run from home with the Internet making virtual meanings and general online communication as easy as a click on aSkype button. Theres also evidence that a good way to raise productivity is to let more employees work from home. The saving in time and money is the most obvious benefit of not having a daily commute, but having agarden office also means that you are far enough away from home and family distractions. If you are self-employed you can get some tax allowance for fixtures and fittings. If VAT registered you can claim back the VAT on some of costs and fittings. 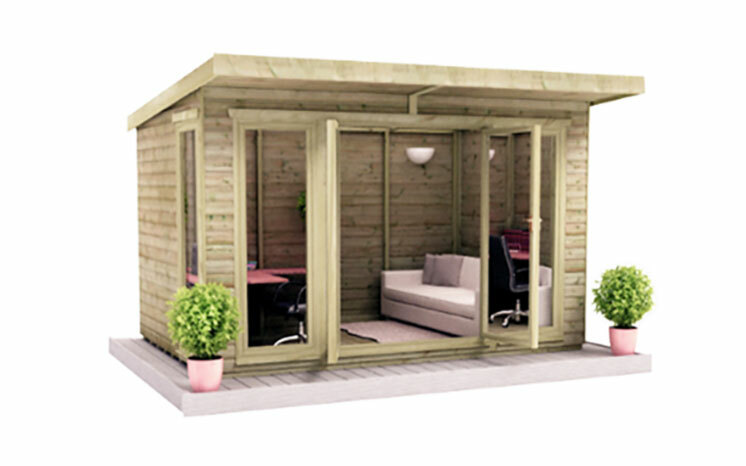 A garden office will quickly pay for itself if you are no longer having the expense of a rented office somewhere else. 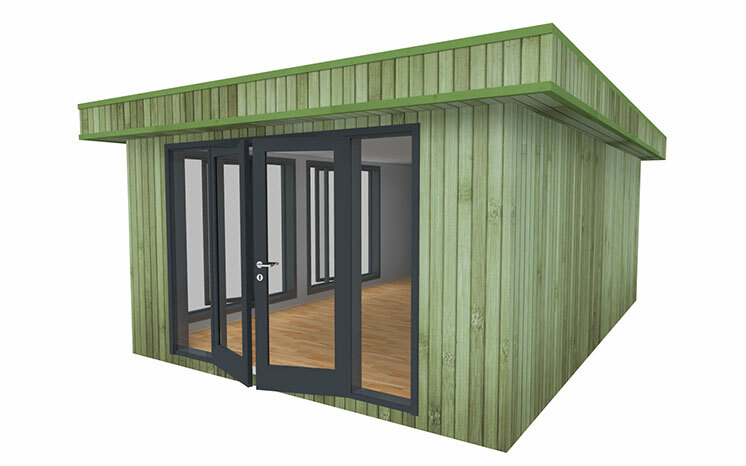 Compared to a loft conversion which requires building regs and are becoming increasingly costly due to things like fire doors, double glazing, wiring etc or planning permission for a house extension, a garden office can be a very quick and painless solution. Many commercial offices are often sick offices in that a combination of poor cleanliness, dirty air filtering and air conditioners and poor combinations of building materials like plaster, brick and concrete will make for a poor working environment. There can also be high concentrations of electrical equipment and magnetic fields that are not very healthy in the long term. How much better to have a timber building set in your garden closer to nature? You could even have your pet dog or cat with you in most cases they are better than work colleagues and they will always agree with you! When not using your garden office for employment, you also have a hobby room, or a leisure space, man (or woman) cave, a summer garden retreat or simply a room for a bit of extra storage. Garden and home offices are what property developers describe as bonus rooms. You have a three bedroom house for sale but when people view the property they see you have effectively an extra room in the garden what they thought might just have been a shed is a great addition to the property. There is certainly evidence from estate agents that bonus rooms help sell properties! This entry was posted in Garden Offices on 22nd September 2015.